Ever since I bought the HD650’s I’ve been searching for a microphone solution for gaming. I tried lavalier microphones and desk-standing microphones, but they would pick up too much ambient sounds, especially keyboard clicks. I realized that for what I want I need a sensitive mic that is close to my mouth, that way it would pick up my speech way more than the keyboard and then I could apply a threshold for muting the mic in software. I heard a few “boom” or “headset” mics like the ModMic or Vmoda Boompro, but they didn’t sound any better to me than my 1$ dynamic lavalier mic and most of them would require me to stick something on my headphones or attach a magnet to the outer grill that might scratch it. Might be convenient, but not for me. I thought about the option of a real condenser mic and an arm on the desk, but that seems excessive for what I need and I’m afraid it would obstruct my vision of the screen. I guess DIY is the only way. Instead of getting a microphone that is attached to a cable and cut it, I decided to make the whole thing modular and use a voice recorder mic. This is a stereo condenser mic with a short 3.5mm connector and it sounds a lot better than all the “gaming” mics and cheap lavalier mics I’ve heard. For the “boom” arm I used a flexible shaft from a USB LED light. It should have no problem holding the weight of the microphone and it could be folded in every direction to allow stowing when not needed. The shaft is 5mm in diameter. For the prototype I cut the shaft longer than I need so that I could wear it and find the right length. 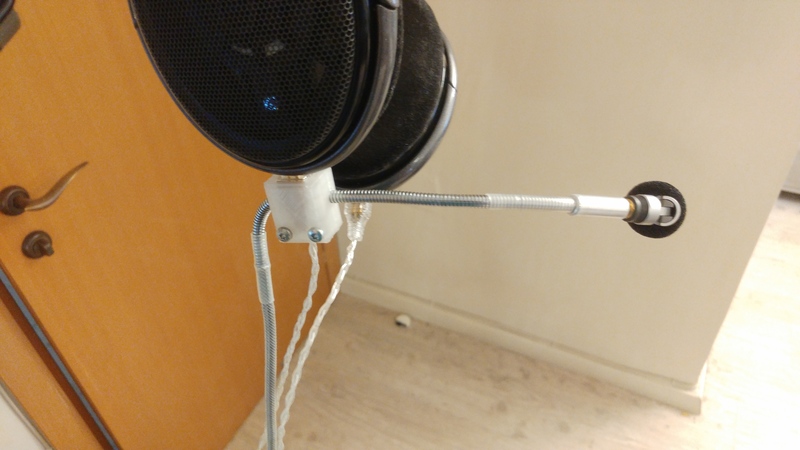 The main challenge for me in this project was how to secure the arm to the headphones without potentially causing damage and without it being bulky and heavy. I decided to clamp it on the connector of one of the cups. The connectors for these headphones are very tight, they do not move at all in the housing and it’s pretty hard to disconnect them (even after 3-4 years of daily use). Seems like they should handle the light forces that will be applied to them when moving the mic around. I used pieces of cork sheet sticker to provide more friction against the connector and to maybe protect the connector when being clamped. The microphone itself will connect to a female 3.5mm connector on the end of the arm, secured in place with a rigid piece of heat-shrink tube. The photos above show the first prototype. The arm goes straight through the 3D printed clamp to allow moving it inside to find the right length – once it was found, the arm was cut to length and the wires fed from the bottom. The arm is held in place with a set screw and the two parts of the clamp are connected with screws for plastic. additionally, I put a male 3.5mm connector on the bottom of the clamp so that I could quickly and easily disconnect the cable when I’m not using the microphone. The cable in the picture was also replaced with a thinner, lighter and more flexible one. This one was very uncomfortable and would put too much weight on one side of the headphones. I used Sugru for strain relief, it turns into a very resilient rubber when it sets. I may have used a little too much here..
That’s it. The mic works perfectly and it’s barely noticeable. I’ve been using this mod for a few months now and I see no signs of the connectors loosening or moving at all when folding and unfolding the arm, if this was a concern for anyone. When I initially commented I clicked the -Notify me when new comments are added- checkbox and now every time a remark is added I get four emails with the identical comment. Is there any manner you can take away me from that service? Thanks! I don’t see you in my subscribers list and the support team and I tested the system and it seems to be working fine from here. Are you still experiencing problems? Can you please Email me at daniel@harariprojects.com if you do, so we can further investigate?